Edited by Mariusz Pawelec and Dariusz Rott. Status: available, see sample PDF. 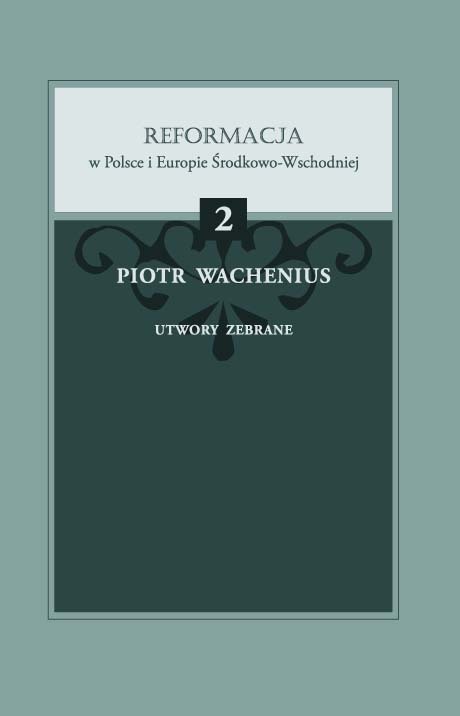 Collected works by Piotr Wachenius is a critical edition of three works: an anti-Catholic polemical treatise Wierne a prawdziwe okazanie (The Faithful and True Presentation), a short prayer book with a catechism Summa świętego krześciańskiego nabożeństwa (Summary of the Holy Christian Worship) and a book of religious domestic songs Hymny moje domowe (My Domestic Hymns). Little is know about Piotr Wachenius (Petrus Vachenius Strelicenus), an author of several books printed in 1612. We have only known so far that he served as a collector of customs duty in Pszczyna, a city in Silesia on the border of Poland and the Czech Kingdom. His Polish writings – both in prose and in verse – focused on religious issues. It is clear that the author was a Calvinist. It is possible that earlier Wachenius had been a member of the Church of the Czech Brethren: one of the poems in his book was written in Czech. New evidence tracing Wachenius’ origins to Strzelce Opolskie/ Groß Strehlitz in Upper Silesia has been discovered in research libraries and archives in Poland and the Czech Republic. Th is is a clear evidence of ties between Polish and Czech Protestants in the sixteenth and seventeenth centuries, which proves that there is a need for continuation of studies in Silesian Protestantism.